ISSIE TOP RELEASE, A SURPRISE AND TWO DISCOUNTS! Today I am super excited to announce that the Issie top pattern is now available HERE! This pattern has been so much fun to create, test and sew. The top offers many options and is very adaptable. Today I am also letting you know about two discounts you can enjoy...You can receive 10% off the purchase price until the November 11 (10pm Melbourne time). Yes, this is a long discount as it will apply thoughout the Issie tour also. Use coupon code: ISSIERELEASE10 (apply at checkout). 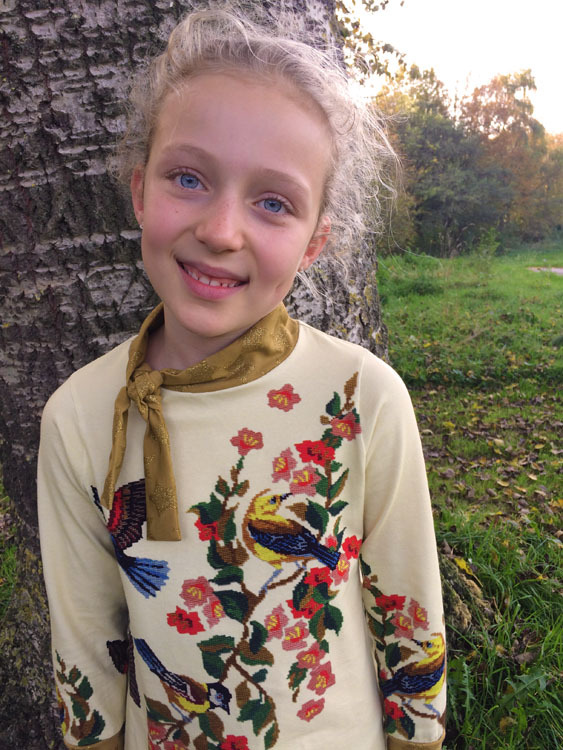 Read on to find out about the other lovely discount and a surprise addition to the Issie top pattern! 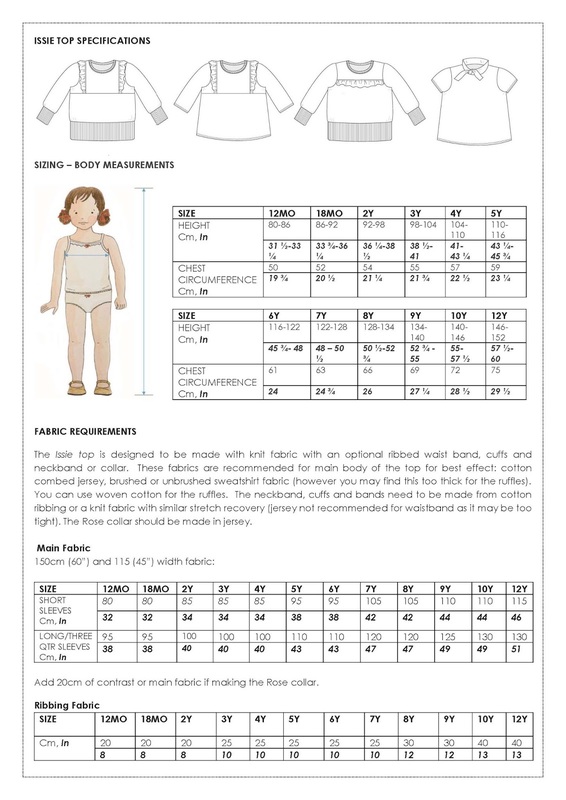 Below you can see a snapshot of the options of the pattern, sizing and fabric requirements. Do you notice anything new in the line drawings below? A collar? Read on! About two weeks ago, my friend Mijke from Riddersenrozen (lovely IG sewer) who was part of the testing group, asked if I liked a collar she created and used on her Issie top. She sent me some photos and I liked it. Then I made one and I loved it!!! 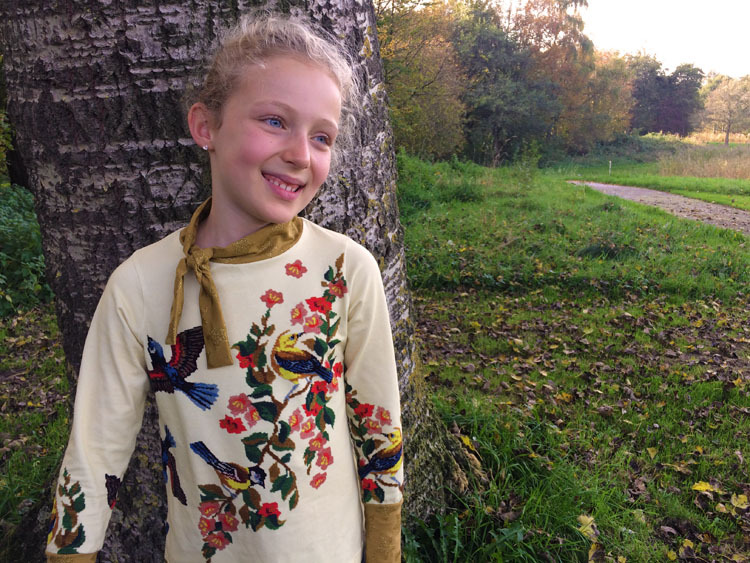 Mijke designed the pattern piece and helped me through how she created it. It is really pretty and I think adds a little elegance to the Issie top. It is called the Rose collar and is named after Mijke's lovely daughter! I am going to save my photos for a post tomorrow where I show you how you can easily adapt the Issie top pattern to achieve a new look. Below is beautiful Rose wearing her Issie top with Rose collar. Knit fabrics can be sourced from unlikely places too. I was lucky enough to find these two tones of jade at my local op shop this week. I didn't hestitate to wash, chop and sew up another Issie top for my Issie! For this version, I used the single ruffle, long cuffs and waistband. Isabella loves this colour so I know she will reach for this top a lot! 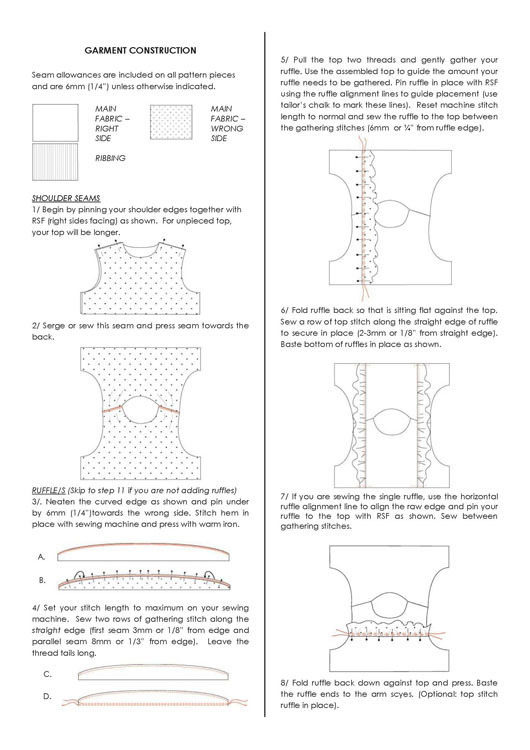 I draw all of the illustrations in the tutorial for the Issie top pattern. This is a first for me and I loved it! I hope you like them too! The Issie top was tested by 32 lovely ladies. They all did a wonderful job and made soooo many beautiful tops!!!! A big thank you to An, Anke, Annick, Ariane, Brooke, Cassy, Christina, Cindy, Claudia, Dagbjort, Deanna, Deborah, Emily, Elien, Eveline, Fabienne, Isabelle, Jenny, Kristie, Linde, Lindsy, Loni, Marieke, Marjolein, Mijke, Nathalie, Nelleke, Qwinta, Renee, Susanne, Tinne and Tinne. Thank you for all your beautiful sewing and feedback. You all did a wonderful job and helped me so much! Please search the hashtag #issietop to see all the lovely tester versions! 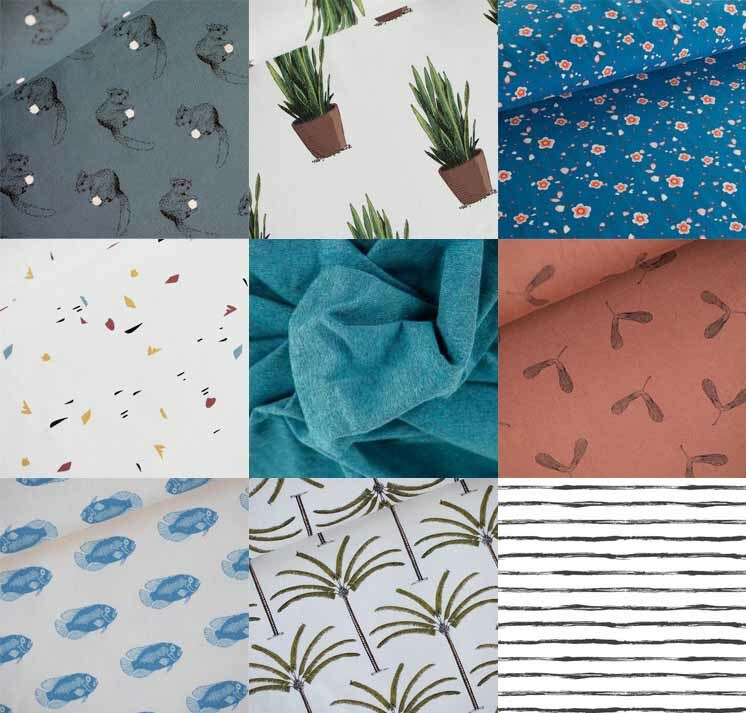 Fabrics are (left to right, top to bottom): Squirrels and Sansevieria by See you at six, Flowers Blue jersey, Scribbles French terry by See you at six, Teale marle jeresey, Maple seeds by See you at six, Fish French terry and Palms French terry by See you at six, Stripes French terry by Eva Mouton. Come back tomorrow to see some photos of Issie wearing her new top with Rose collar! And head over to my IG page for a chance to win a copy of the Issie top pattern. Love the colour of this one. Congratulations on the new release Suz! Great pattern! Will there be a Dutch version of this pattern as well? Because in that case I would like to wait until the release of the Dutch version. Congratulations Suz! I love Issie!